Marble is a famous option for tabletops, fireplace mantles, flooring and countertops. While this brings in natural beauty and charm to you home, this still requires serious and special care in order to prevent stains and damages that occur easily because of the porous surface of the marble. With a little of elbow grease and time, you can certainly polish marble countertops and make it look like new again. If polished well, marble countertops can offer durable and sophisticated tops, which are better than wood or laminate. Polishing is usually done after cleaning to make the marble countertops shiny. If this is stained and dirty, you might need to apply poultice or consider sanding it. Does your marble countertop look dull or maybe with some light scratches into the surface? You can definitely restore the gleam while at the same time eliminate the minor imperfections through polishing them. DIY options are widely acceptable. This seems to be a better option especially to those individuals who wanted to save money from cost of hiring a contractor. But though you can save money, you need to realize that if you do it yourself, you might ruin the marble and make it worse for the professionals to fix. Your perfect bet is to actually find the most trusted marble countertops polisher with proven expertise and complete sets of equipment that can bring back the original luster of your marble countertops. 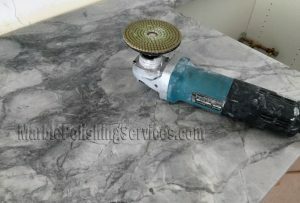 A professional marble polisher will initially inspect your countertop to figure out if there are cracks and chips, which may turn to bigger and more serious problems. Once these issues are repaired, your countertop will be given expert polishing. An expert in this field will then seal it to avoid chips and new cracks from starting. If the polishing is completely done, you can now take care of the daily maintenance even by yourself. You should clean your marble countertops using plain and warm water as well as cotton string mop. These are used to keep the surface clean and free from ice salts, water build up and dirt. Make sure to also clean spills, oil and grease so they do not seep to the marble and leave some permanent stain. Call your local marble polisher contractor now and this expert will help you with maintenance issues and marble polishing. Hiring professional will definitely save your headaches, time and lots of money. Most importantly, marble countertops inside your home will look best always. Professional marble polishing services are made available by expert team that focuses on clients’ hundred percent satisfaction. The reliable marble countertop polishing company has efficient team for polishing and cleaning purposes at the most reasonable price. Taking these services, you can expect for clean and shiny marble countertops in your home. Just make sure that you will contact a legit and professional service provider that can meet your exact needs.